Fabulous Family Friendly Vacation Home, with everything that you could possibly wish for, to make your unforgettable Florida Vacation. We specifically chose this design of home as the layout and facilities are ideally suited to either two families vacationing together or an extended family of Grandparents, Parents and Children. As proud owners of Villa Four Corners, we have worked hard to ensure that we can offer you and your family a wonderful choice of either activities or relaxation. Take a leisurely dip in the South Facing Pool or stretch out - possibly with a good book from the library we have provided in the home - on the extended Sun Deck Area, with its large selection of Patio Furniture and soak up some of that famous Florida Sunshine. The Children (and Adults!) will just love the Fantastic new Games Room with Full Size Table Tennis, Foosball Table and Electronic Darts. For our younger guests we have provided a selection of Toys, Books and Games to keep them amused and entertained. New for this year is the Slimline PS2 with Two Controllers and a selection of games suitable for all the family including Sports and Racing Games. If you need to check out Park Opening Times or Book a Tee Time log onto the Internet with the FREE Home Computer and ensure that you stay up to date with your e mails. If you are bringing your own Laptop we even have Hi Speed DSL WIFI to enable you to connect to the Internet. For the time you plan to be away from the home, Villa Four Corners is ideally located for Disney (12 Minutes), Sea World (20 Minutes) and Universal Studios (25 Minutes). There are numerous Golf Courses nearby including the Greg Norman designed Champions Gate which is 5 Minutes from Villa Four Corners. If you are venturing a little further then Villa Four Corners location means that you are minutes from Interstate 4 , with the Surfing Beaches of the Atlantic Coast about 1 hour in one direction and the Warm waters and soft sands of the Gulf Coast a similar distance in the opposite direction. Furnished in Natural Shades and Timber with the entire living area tiled this Villa provides a cool and calm environment in which to relax after a hard day at the nearby theme parks or shopping malls. We make it easy for you just as soon as you arrive! Because there is an electronic lock there is no need to collect or return keys, no need to register at an office before you get to the villa. Just drive straight to Villa Four Corners and enter the unique access code which is issued to you prior to arrival and your vacation has begun! What is more that if you are travelling as two separate families then you can come and go as you please and do not have to worry about who has the keys, or will someone be home when you get back. The Villa has a South Facing 28 Ft Pool and Extended Sun Deck Area which is completely screened includes a good selection of Patio Furniture (with outdoor seating for 8 People and an Electric George Foreman BBQ). The Pool is equipped with an electric Pool Heater which is an optional extra in the cooler months, as well as underwater lighting and a swimout on which you can sit and watch the evening Sun go down. Stretch out in the King Size Bed in Master Suite 1 and enjoy the view out onto the pool deck. If you are feeling more energetic then this suite has direct access to the pool deck via its own patio doors, perfect for that dip before Breakfast. The well-appointed Full Bathroom benefits from "his" and "hers" washbasins, walk in shower cubicle and separate tub. Master Suite 1 is equipped with Cable TV and VCR, it also benefits from plenty of drawer space and a large walk in closet. Master Suite 2 enjoys a Queen Size Bed in which you can rest you weary body whilst watching the Cable TV with over 70 channels. Bedroom 3 has a Full Size Bed whilst Bedroom 4 has Twin Beds. Bedrooms 3 & 4 share the Family Bathroom with Bathtub and Shower. All Bed Linen and Towels are provided including Pool Towels. There is also a High Chair, Crib, Stroller and Playpen provided FREE for use during your stay. There is a fully equipped kitchen with all the appliances including Dishwasher, Microwave, Oven, Hob and Large Fridge Freezer. There is also a separate Utility Room with Washer, Tumble Dryer, Iron and Ironing Board. Leading off from the kitchen is the Formal Dining Area with seating for 8 People . Further seating for 3 for casual dining is available at the Breakfast Bar. 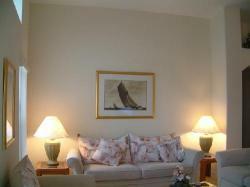 Moving on into the Spacious and Comfortable Family Room with the Large Screen TV, DVD Player. This is a perfect room to relax in overlooking the Pool Deck and with direct access out onto the shady Lanai via the Sliding Doors. For your entertainment we have also provided a selection of Books,CD�s and Board Games. All the major theme parks are close by including Disney 12 Mins, Sea World 20 Mins and Universal 25 Mins. Busch Gardens in Tampa is about an hour away. There are a number of Supermarkets and Malls close by including a Publix Supermarket and a Walgreens Pharmacy which also sells groceries. Just north of Four Corners on the US 27 is a Wal-Mart Supercentre which is open 24 hours and sells just about everything. 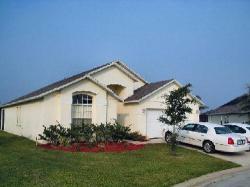 Just to let you know we had a fabulous time in Florida, and found the villa great. The use of the internet was really useful for Gary to keep in touch with the family. Everyone also enjoyed the use of the pool, especially young Tom who would have, given the chance, stayed there every day and not gone out. Hope you are both well. We arrived late afternoon yesterday. The Villa exceeded our expectations. The rest of the family arrives today. They will be overwhelmed. Wait until the kids see the Pool !! I am glad we connected. We�ll take good care of your place. My family wish to thank you for making our trip to Florida a memory to remember. Your home was beautiful, and met our every need. We had a wonderful stay at the villa, positively a holiday to remember, with many happy memories (but not the speeding ticket). the villa is superb and the photos on the web site do not do it justice. Balance to be paid - 8 Weeks prior to arr to arrival.